There is a cartoon that describes a conversation between two men in Scotland. One of the men asks, "What is the special Scottish word for when it is cold, grey and raining." The other man replies by saying, "Summer." This most certainly was the case when we arrived in Stirling today. The trip down was beautiful, sunny and warm, but that all changed just before the outreach began. Yet, despite all the rain God was glorified! At 2pm, we met together to prepare for the afternoon of outreach. The sky was dark and rain was threatening, so we decided that the best thing we could do was start the ministry as soon as possible. While the team handed out a few tracts, I began to preach. The text I chose to preach on today was John 3:16 - "For God so loved the world, that he gave his only Son, that whoever believes in him should not perish but have eternal"
I started by talking how people today always seem to overcome by bad news, and as a result a sense of hopelessness can abound. From there I was able to introduce a message of Good News. The message that says that God is Love, and that He can forgive sinners on the basis of what Christ has done. A few people came out of shops to listen, and a few others sat opposite to the preaching. One young man objected to me saying, "God is loving." His reason for the objection was that he couldn't see that God had done anything for him. I answered his questions, but it was clear he wasn't overly interested in answers, instead he just wanted an excuse to justify his unbelief. I preached for around twenty-minutes, and in that time we saw the rain come and go. After, I finished preaching Jason stood to preach on how only God is good. For a new preacher he did well. Then it was time for Craig to step up. By this time the heavens had opened up and the rain was coming down quite hard. Yet, a group of people stood and listened to the preaching under the cover of a local shop entrance. Also, during the preaching, a group of teenage girls stopped to ask questions of Craig. Even though the rain was falling, and it was wet and cold, the Gospel was still going forth. Eventually after all the preaching had finished we began to pack up. As we got our bags together a young man who was smoking a cigarette engaged us in a conversation. It started off by him realising that I was an Australian and thinking that was 'cool.' The next part of the conversation then went to him recommending different alcoholic drinks I should try before I leave for home. Somehow the conversation got around to the fact that we were Christians. The young man was quick to declare that he liked Jesus and that he was a Christian also. So I asked him, "If you die tonight, why will you go to heaven?" To which he answered, "Because I'm good." This then opened up a whole gospel conversation. We spoke about how by nature we have all sinned, and none of us deserve God's Heaven. From there we explained the cross, and how it is only by the mercy of God that any of us can ever be forgiven. The young man visibly changed throughout the conversation. He started as a boasting young man, but by the end you could see the conviction upon him. He knew that he was not good, and that he needed the Saviour. The young man then took a tract and also a Gospel of John. Please pray that the Lord would save him. Even though the rain came down, we still had many gospel opportunities. Praise God for His faithfulness in allowing us to declare Jesus. It was a lovely, and warm day as I made my way to Scotland's largest city. The plan was to meet with the guys at 1pm, but God in His sovereignty had other plans. As I was making my way to the outreach I discovered a massive traffic jam which resulted in it taking thirty minutes to move two miles. Needless to say I was now late for the outreach! When I finally arrived in Glasgow, I discovered that the outreach had already commenced. Craig Scott had come across a Muslim group trying to win converts, so he decided to go and talk to them. It was a real interesting clash of world views in that part of Buchanan Street, for there was the Muslim group, the Communist group, and a bunch of Scots playing bagpipes. In the middle of all that was our small group of Christians handing out literature and talking to people about Jesus Christ. Craig spoke to the Muslim for quite sometime, and while he did that the rest of us were able to hand out many tracts. The position I was in allowed me to distribute around two-hundred tracts in about twenty minutes. People were friendly, and some even came back asking for some more literature. After Craig had finished speaking to the Muslims, we made our way to the top of the street in order to begin the open-air meeting. We found a spot that appeared to be ideal for our purposes, and we began to share the Good News. I was the first preacher up, and I took for my text Acts 16:30-31 - Then he brought them out and said, "Sirs, what must I do to be saved?" And they said, "Believe in the Lord Jesus, and you will be saved, you and your household. From that text I was able to talk about how in life we have many questions, but the most important question we should be asking is, "How can I be made right with God?" From there I was able to provide the answer that is found in Jesus. Things were fairly slow during the preaching. A few people sat to listen, but many others walked-by. One man sat and listened to the whole message, and at the end he took a tract. About half-way through my message a Muslim man with his family stopped to listen. He seemed to be very interested, but left before anyone could give him a tract (although, I did see him later on in the day and he gladly took literature). While I was preaching a young lady came up to ask a question. She was a Christian and was struggling with her spiritual walk. Since at that moment I was preaching, I couldn't deal with her specific pastoral need, so I referred her to Craig who was able to help her. At the end of the message, a well-meaning Christian man came up to me and wanted to debate Bible translations. He believed that the King James Version is the only real version, and that all other translations make Jesus to be a liar. He even argued that the Greek and Hebrew was in error. I answered his questions briefly, and then continued on the outreach. The questions that he raised are questions that should be discussed and answered, but that is an 'in-house' discussion, not one for an outreach. By now Craig had stood up to preach. It has been good watching Craig's open-air preaching develop in the time I've known him. I truly believe God is going to use this young man to reach the people of Glasgow. Make sure you are praying for him. While Craig was preaching a drunk man approached him and began to be silly. This drunk didn't pose any threat, he was just 'out of it'. At one point he lit a cigarette and began to walk around Craig. This riled up an onlooker who walked up the drunk, smacked the cigarette out of his mouth and told him to be more respectful. A couple of us had to intervene to make sure no violence erupted. By this stage it was getting close for me to head home. But just before I left it was great to see Dane arrive with a large group to continue on the outreach. Dane and I would disagree on many points of theology, but we agree in the Gospel. I am thankful for men like Dane, and those with him who are passionate about preaching Jesus to those who are in the darkness. As Dane began to preach I made my farewells to the group. Today was my last outreach in Glasgow before returning to Australia. While it was great to work with all these different Believers, it was also sad to say goodbye to them. I will miss working alongside them, and I will miss being able to preach the Gospel in the beautiful city of Glasgow. As the motto of Glasgow use to say, "Let Glasgow flourish by the preaching of the Word and the praising of Thy name!" It has been a couple of months since I have taken time to write what has been happening in Scotland. The reason for this is that four months ago my daughter was born, but we have discovered she has a rare bowel disease. Numerous trips back and forth the hospital has taken up much of my time which would have otherwise been devoted to evangelism. However, in the midst of all that the Gospel has been still advancing. I've had opportunities to spread the Gospel in the hospitals, via tracts and personal witness. While I would have loved to get out on the streets more often, I have found that God has given me more than enough to do in day to day life. On Saturday, 24 May, I was finally able to get back out on the streets of Scotland to proclaim the Gospel. I was invited to Stirling by the Reformed Presbyterian church plant there to assist them on an outreach. We arrived in the historic city at 2pm, and immediately I noticed that the High Street was full of people. I found a good location to preach, and from there the outreach began. The first preacher for the day was Craig Scott. The plan was that he would preach first, and then I would follow, but God in His providence had other plans. As Craig preached a few people sat down to listen. While he preached and people listened, I handed out tracts to those who were walking past. As I did this I noticed that a young man who was well dressed and sat down next to a lady who was listening. He had a coat zipped up high, but I could see that he was smartly attired. At first, I didn't think much about this, but then I noticed he began to engage this lady in conversation, before too long he had produced a booklet and handed it to her. This booklet was a Mormon pamphlet that spreads their message. It turns out that two Mormon missionaries had snuck in to try and spread error as people listened to truth. After a few moments I was able to engage this LDS missionary in a conversation. It turns out that he travels between Ireland and Scotland, but is originally from Utah. He was very polite as we began to discuss different issues. At one point he asked me, "What do you like about our church?" My reply seemed to shock him, I said, "To be honest, I like nothing about your church, as according to Galatians 1 it preaches a false gospel." Elder J— was surprised at my bluntness, but we were able to have a great conversation. I asked him to explain how someone was saved, and he replied by saying we need to repent, have faith, be baptised, and keep the commandments. He went on to say that salvation is much like a person trying to cross a big canyon. We do as much as we can to bridge the gap, and then finally God's grace takes us across the final bit. I pointed out that while the Book of Mormon may teach such doctrine, it is actually foreign to the Bible. At this point I quoted from 2 Nephi 25:23 (Book of Mormon), which states, "...for we know that it is by grace that we are saved, after all we can do." Then, I compared it to Ephesians 2:8-9, "For by grace you have been saved through faith. And this is not your own doing; it is the gift of God, not a result of works, so that no one may boast." Elder J— didn't have an answer for this verse, except to point to James 2, which I was able to answer by showing that James 2 talks about works after salvation, not works for salvation. From there I was able to show numerous other verses that explain that salvation is not based on what we do, but rather it is based upon what Christ has done. As I explained the Gospel to him, a man interrupted and politely asked if he could listen into the conversation. We both agreed that he could, and I continued to present the Gospel. Elder J— was quickly trying to get onto a different topic, so I asked him about the Book of Mormon, and if it was God's Word. He said that it was, and that it confirmed perfectly with the Bible. He also, went on to say that there were no contradictions between the Bible, and the Book of Mormon. I replied by saying I had already showed him one in relation to salvation, and that I could show him another if he wished. Elder J— asked me to show him another contradiction, so I asked him, "Where was Jesus born?" Elder J— quickly replied, "Bethlehem." At this point I had him open his book of Mormon to Alma 7:10 which states that Jesus was born in Jerusalem. Elder J— just looked at his book, and then said, "The Bible says that also, as it is cross referenced to Luke 2:4." So we turned to Luke 2:4 and discovered that the Bible says Jesus was born in Bethlehem. At this point Elder J— called over Elder G— and asked him for help. Elder G— got to hear the Gospel also, and then made this admission. He said that the Book of Mormon had made a mistake, and got this doctrine wrong. This then opened up a whole discussion on how we can know the truth by comparing Scripture to Scripture. After talking about this for awhile the LDS missionaries had to leave, but both of them willingly took tracts. The man who has asked to listen in was still standing with us at this stage, and he turned to me and said, "I will never become a Mormon now." I asked if he was a Christian, and he admitted that he was an atheist. For about the next thirty minutes we had an excellent conversation on apologetics and the Gospel. This young man was very open to learning more, so he took a tract, and said he'd do some research. It is always nice to have conversations with atheists who are friendly and open. But, the next atheist I was about to encounter was not friendly, nor open. He had begun heckling Craig so I went along to see what I could do to assist. It turns out that this atheist was the son of a missionary. He was an apostate, who had turned his back on Christianity, and had embraced the life of sin. No matter what you said this atheist would just rant saying that he has heard it all before. Yet, when you questioned him he admitted to never hearing it before. This man was just angry at God, and was not prepared to talk. He just wanted to rant and rave. We were able to present the Gospel to him but he just scoffed. By this stage the day was getting late, so we decided to pack up and head home. As we were packing up three older women walked past and yelled abuse. We were able to engage them in discussion, and it turns out that they just hated Christianity and wanted to banned in public. One of the ladies said to me, "I will never go to church as that is only for sinners." I answered her by saying, "Well, I guess I'll see you in church tomorrow then?" This stopped her for a moment, and we were able to talk of Christ again. Overall today was an excellent day. The Gospel was proclaimed; people heard of Jesus, and many people wanted to learn more. May Christ be honoured! Where does one even begin to tell of the great things the Lord has done? Today, God showed His kindness towards us, and also to the people of Glasgow. Even though, as a people we all deserve God's judgement for our sin, in mercy He allowed the Gospel to go forth once again. For me the day began with doubt. As I looked out of my window I could see typical Scottish weather. It was dark and rainy. My thoughts were that the outreach that had been planned for that afternoon would end up being a washout, but we prayed and asked the Lord to give us an opportunity to preach the Gospel. I arrived in Buchanan Street, Glasgow at around 1pm, and I was quickly joined by Brothers from numerous churches. Today saw a good mix of churches and theological positions. We had Reformed Presbyterians, Free Presbyterians, Baptists, Reformed Baptists, Pentecostals, and general Evangelicals all come together for the purpose of declaring the good news of Jesus. The outreach began with Craig Scott preaching the Gospel. His text was John 3:16 - "For God so loved the world, that he gave his only begotten Son, that whosoever believeth in him should not perish, but have everlasting life." For about twenty minutes he proclaimed the Gospel, and as he did this, the other members of the outreach engaged people in one to one conversations and handed out tracts. As I was giving away literature a Christian man from a local church came up all excited, and thanked us for taking the time to proclaim the Gospel. It is always good to be able to serve as a ministry of encouragement to other Believers. Throughout the day we would find time and time again that many from churches would feel motivated and encouraged to be bold witnesses for Christ. At around 2pm, it came time for me to preach. My text for the day was Matthew 5:8 - "Blessed are the pure in heart, for they shall see God." My basic outline was to focus on how many people think they are going to heaven, but Jesus says we need a pure heart. I also focused on how our heart is sinful, and that it is only by Christ's death, burial and resurrection that we can get a pure heart. A few people gathered to listen as I preach, and then the questions began to flow. One young man asked a few questions from a skeptics position. He wanted to know about how we got the Bible, and is it reliable. One of the best things that can happen in any open-air meeting is crowd interaction. The crowds will literally double or triple when this happens. God was kind to us on this day, as the crowds began to grow and they stayed around to listen to the interaction and the Gospel. I tried my best to answer the objections from this young man, but at the same time I wanted to keep bring it back to the message of Jesus Christ. Eventually, other hecklers began to chime in, and for the most part they were polite. However, a homosexual heckler was the most vile and intolerant person we encountered all day. The issue of homosexuality also seemed to keep coming up during the open-air. Even though I didn't mention it, the crowds wanted answers on the topic. When I answered their questions about this sin, I would take them to the Bible and read them what God's Word said. I would also stress that God is against all sin, not just homosexuality. From there I would explain that Christ can forgive all sinners. Throughout my open-air we kept fielding questions on the issue of the reliability of the Bible; the problem of evil and homosexuality. These seemed to be the big questions of the day. I preached for over an hour, and then was able to engage a person from the crowd in a conversation. Many tracts went out today, and many conversations had. Also, good size crowds gathered for the preaching. Praise God for His goodness in allowing Glasgow to hear the Gospel yet again. For those who read Part 1 of our Love Scotland report, you'd be aware that our plans for the outreach were dramatically changed when Tony Miano was arrested in Dundee while preaching. While man no doubt thought this action would silence the Gospel, the opposite has proven true. As a result of these troubling events, more people have come under the sound of the Good News of Jesus. The following report briefly details what happened for the last half of the outreach. We spent most of the day sitting in the Sheriff's court in Dundee waiting for Tony to appear before the court. Since we had a combined churches evangelistic outreach planned that night I was starting to get worried that Tony wouldn't be able to make it. But, God was in control. Tony was bailed, and we were able to make our way back to Perth to prepare for the evangelistic rally. God showed Himself as mighty at that meeting. We weren't sure how many people would attend, but to our surprise the church was filled. We had seating for fifty people, and forty-seven attended. I led the service, and was able to briefly share the Gospel. Tony preached and he also shared the Gospel with all those gathered. Afterwards we were able to have some great conversations with non-Christians who were in attendance. Personally, I got to speak to a man who lives locally, who had read in the news about Tony's arrest. This man came along to express his support even though he was not a Christian. As I spoke to him I discovered that even though he was in his fifties, he had never been into a church before. God had used the arrest of Tony to bring this man under the sound of the Gospel for the first time. The man took some literature and said, "I have been given much to think about tonight." During this time, Tony was chatting to a husband and wife who were Roman Catholics. Tony explained to them the Gospel of Grace, and they willingly took literature explaining the way of salvation. To top all this off, many Christians were saying how encouraged they were at having Tony present to preach. It was great to see a number of churches represented, and many Christians from different theological backgrounds coming together for the Gospel. The weather was fairly bad today. The rain was on and off, so that limited what we could do. However, we were able to spend some time down the city centre of Perth handing out tracts and talking to people. Owing to the weather we only spent an hour on the streets, but in that time hundreds of tracts were distributed and Chuck was able to preach. Please pray for the ongoing work here in Perth. Beautiful blue skies greeted us as we crossed the snowy Scottish Highlands to preach in Inverness. We arrived just before lunch, and met up with some local Christians whom we were working with for the day. Out of all the places we ministered in for the Love Scotland tour this by far was the coldest in weather, but the warmest when it came to response to the Gospel. Chuck was the first preacher up, and as he preached people began to show interest. While no crowd gathered, people did however start coming up to those handing out tracts, and began to ask for more information about Christianity and if they could have a Bible. In the space of a few minutes numerous tracts were given out, church invited also issued, and God's Word distributed. This was the trend for much of the day. People would stop, and want to learn more. Tony was the next preacher up. He preached for around twenty minutes, and at the end an older lady came up to him to talk. This lady had been in the Church of Scotland for some time, but didn't seem to have a strong grasp on the Gospel. Tony was able to gently and lovingly explain it to her. By this stage the wind was picking up and the temperature was dropping, so I thought it'd be wise only to preach for a short while before retreating to warmth. I started off by talking about death being the great leveller, and how it doesn't matter what we have in life, one day we will all be the same when we are dead. During my message one man began to heckle me asking what God had done for him. I engage him and explained the Gospel to him. The heckle caused a few people stop to listen and before long a crowd formed. From that crowd came a young man who started off as arrogant atheist, who shouted that he trusted science and not the Bible. I engaged him apologetically and began to reason with him. Before our eyes he softened to the Gospel. He listened, and even admitted his positions had failings. At the end of our time he took a tract, and said, "God bless you." Our time in Inverness was wonderful. The Police were friendly and encouraging of open-air preaching. The local churches were encouraged, and many Christians came out and thanked us for preaching in public. But, best of all, Christ was lifted high, and people looked to Him. Praise God for an excellent day! Today is the final day of the Love Scotland tour. After a week on the road, we decided to finish our outreach in the most populace city in Scotland. At 11am we met with local Christians from seven different churches for a day of outreach in Glasgow. It was great to be joined by so many different Christians. All had joined together with one purpose in mind, and that was to proclaim the Gospel of Jesus Christ. Chuck, Tony, Dane, Craig, and I all preached the Gospel in the open-air. During that time many tracts were handed out and many conversations were had. So much happened on this day, that I think it is best just to let the following videos detail some of the Gospel outreach. From January 7-13 we engaged in a nationwide outreach throughout Scotland. This outreach was made up of three full-time workers, and also numerous Christians we met in different cities throughout this great land. We started the week with one plan in place, but the Lord had other things in store for us. However, no matter what happened the Gospel was proclaimed and Jesus was lifted high. The following is but a brief report of all that happened. It was a very Scottish start to the day. It was cold, wet and windy. We left Perth, while it was still dark and made our way to the nations capital, Edinburgh. When we arrived the sun was out, but the wind was blowing. This sadly meant that many of the streets were empty. Since there weren't many people around to witness to, we decided it'd be good to spend some time looking at the Christian tourist sights in Edinburgh. We looked at the church where John Knox preached; we saw the location of his burial, his home and then we went to Greyfriars Kirkyard, it was here that we saw the memorial to the 18,000 Covenanters that were killed for standing up for Jesus. After this we grabbed a quick lunch, and met up with Dane, who is a local Baptist preacher who moved to Scotland from the US. Since he had preached many times in Edinburgh, we let him show us the best locations. We headed down Rose Street, and there we conducted our open-air meeting. Dane was the first preacher up. While he preached the rest of us handed out tracts and engaged people in conversation. One man stopped Chuck and wanted to talk about homosexuality. Chuck carefully and biblically explained the doctrine of sin, and the need of the Saviour; the man left thanking Chuck for his time. After Dane finished preaching Chuck stood up to preach. He spoke about how Jesus is the light of the world, and how many people search for light in human wisdom. The people in Edinburgh seemed apathetic to the Gospel. A few people stopped to listen, but not many. By this stage Rose Street was getting fairly busy, so we moved to a better location to preach. Tony was the first to preach in this new location, and as he expounded the Scripture people stopped to listen. Some people opened windows in the buildings above us, and they stood listening to the preaching. While Tony was preaching, Peter the Atheist began to engage Chuck in conversation. He was more interested in arguing about the Da Vinci Code than anything else, yet, Chuck was able to present Christ to him. It was also during this time that many Christians started to come up to us and express their thanks. They said they were so grateful to have the Gospel being preached in the city of Edinburgh. We were very glad to serve as a ministry of encouragement. After Tony finished preaching it came time for me to speak. I spoke about how the New Year had just begun, but then asked the question, "Why is it 2014?" From there I swung it around to show how time began counting with Christ. From here I went on to explain who Christ is, and what He came to do. A few people stopped to listen, and some were engaged in conversation by other members of the team. While I was preaching a man in a window above me began to heckle. I engage him with the Gospel, but he just laughed it off. As I spoke I began to personalise the Gospel. I asked those listening if they were trusting in Christ. One man refused to answer, but an older lady with a big smile called out, "Yes, I am!" When I had finished preaching we headed down to the Princes Mall to preach to those preparing to go home from work. Dane preached and so did Tony. While they spoke I was able to hand out many tracts, and talk to a Christian who was looking for a church. This lady said she was greatly encouraged by the Gospel and wanted to worship in a church with God's people. I was able to point her to a good church, and encouraged her to attend. By this stage the clock was sitting at 5pm, so we decided to head home. It was a good first day of the Love Scotland campaign. Some days you just cannot plan for! We started the day with the idea that we'd share the Gospel in Dundee for a few hours, and then we'd take a Protestant Reformation tour with a local Elder in St. Andrews that afternoon. However, God had other plans. In God's sovereign will he allowed Tony Miano to be arrested and jailed overnight. It must be stated that due to the ongoing case against Tony, I am limited in what I can report. Some people have written blogs giving their opinions on what happened, but since information is limited I am surprised that they would make grand assumptions in order to blog. The day began quite well. We walked along the High Street of Dundee until we found an empty shop that we could preach outside of. Chuck was the fist preacher of the day. As he preached he received a few hecklers and mocks, but nothing much. During this time Tony was able to buy a homeless lady some food, and share the Gospel. As all this was going on, I simply handed out tracts. After Chuck had finished preaching it came time for Tony to preach. Tony began his message by explaining who Jesus is from the Bible. Quite a few people came up to Tony to thank him as he preached, and many people said they were encouraged. Overall it was very positive in Dundee. One man handed Tony a card thanking him for preaching, and another man slipped £20 into Tony's hand. The Scottish people in Dundee for the most part were readily receiving the Gospel and supporting the American open-air preacher. Some bloggers would have you believe that the Scots were opposed to Tony, and viewed him as some kind of fanatic, but that is not what we saw on the streets. The response from the people was wonderful, however, there were three loud mouthed ladies that caused trouble. As Tony preached, he spoke about sin. He mentioned a wide variety of sins, from lying to stealing. He also mentioned sexual sin (both hetrosexual and homosexual). He never majored on one sin, but after he mentioned homosexuality one lady began to scream in anger. She called out that her son was gay, and as I looked one of her friends saw that I had a video camera in my hand (I was filming the preaching). With that her friend ran over to me and started to try and smash the camera. She was shoving me, and trying to rip the camera out of my hand. I never pushed back, I just told her this is assault and she can't do that. With that the group of ladies walked off, but were all on their phones. During this time a Dundee Council Ambassador came by. I spoke to him and he saw some of the things that were going on. He said he had no issue with the preaching, and that we had freedom of speech and no law was being broken. Tony preached for a little while longer. When he had finished we thought we'd pack up to go have some lunch, and then we'd either head to a different location to preach, or go on our tour of St. Andrews. As we were preparing to leave one of the ladies who was screaming hate, anti-Christian comments and saying about her gay son came up and shoved her camera phone towards us. She said she had called the police and they were on way. We said that was fine, as we hadn't broken any laws. It was at this stage we noticed the police van coming towards us. The camera we had was still filming with Chuck holding on to it. The male and female police officer got out of the van, and approached us. The lady that was hostile and violent towards us yelled out that we had a camera, with that the police broke the law by lunging at the camera and ripping it out of the hands of Chuck. The police seized the camera and put it in their van without even informing us if a law had been broken. The male police officer went and spoke to the hostile lady. He then opened the van, walked up to Tony and declared that Tony was arrested. They never asked him or us what had happened, they presumed guilt and never once asked for our side of the story. Tony asked the officer what he was under arrest for, but the officer didn't answer. Tony was then placed in the back of the van, and it was only then that he was informed that he was being arrested for Breach of Peace due to homophobic hate speech. I pointed out to the officer that no homophobic comments were made, but she wouldn't listen. At this stage I decided I would press assault charges against the lady that attacked me. The police weren't overly interested, but they took my statement and said there is a possibility she will just get a warning and told not to do it again. Chuck and I then drove to the police station to await news on Tony. After being there for about an hour we were told that Tony would be held overnight, and would face court in the morning. The next day, Tony pled "Not Guilty" and now he must return to Scotland in April to face a trial. We are thankful to the work of Christian Concern as they will be taking care of the legal aspects. The Love Scotland outreach was taking a turn towards something we hadn't plan, but our trust is in the Sovereign God. Below is a video in which Tony Miano details his arrest. In Part 2 of the Love Scotland report, we will see what amazing things God did after Tony was released from jail. It has been a few weeks since I have been out on the street witnessing. The reason for this is quite simply fear. I have been afraid of hitting the streets again after two arrests. However, today, I headed over to Glasgow to meet up with a few guys for an afternoon of witnessing. 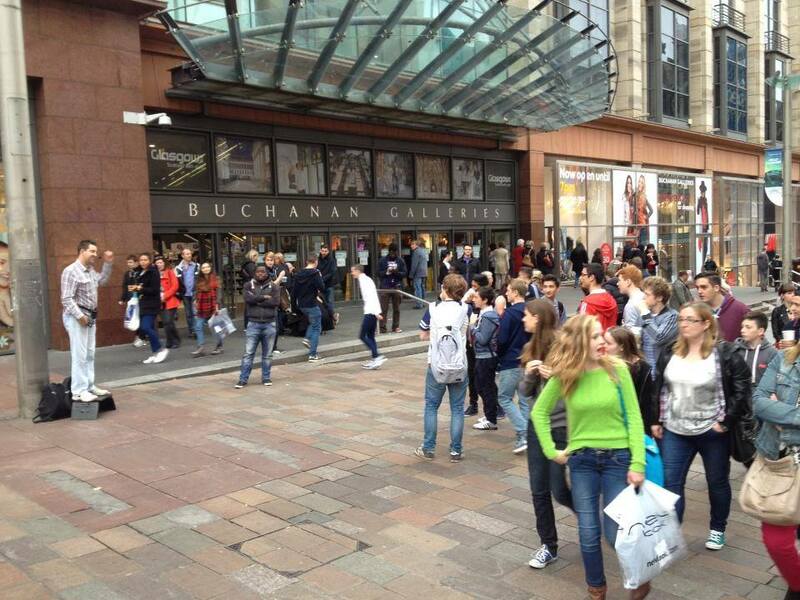 When I arrived in Buchanan Street I was immediately struck with how noisy and busy it was. People were everywhere, and many of the best preaching spots were taken up with buskers. After walking the length of the street, Noman and I found a spot that would serve the preaching well. Noman was the first preacher up. As he preached I handed out tracts and engaged a couple of people in discussion. During this time two police officers walked past, and my heart missed a beat. But, these officers clearly knew the law, as they allowed the preaching to continue. During this time a lady approached me to tell me her story. It turns out that four years ago she was on the streets, addicted to drugs and living rough. One day she heard an open-air preacher declare “Jesus gives freedom”. That is all she heard, and she actually scoffed at him. However, that was the seed which the Holy Spirit would use. The lady told me that she could not get those words out of her mind, and eventually it brought her to a place of repentance. She has now completed Bible College and is setting up a ministry to help homeless women. She thought she’d share this with us as an encouragement. After this I was approached by a man that I had never met, but I knew who he was. His name is Tyler McNabb. Sadly, Tyler is now an apostate. He has forsaken the truth, and followed after Roman Catholicism (James White mentioned him here). Tyler wanted to know why we were preaching in a different location as he had been waiting for us elsewhere. I knew that Tyler was going to be out that day, but Noman and I decided that we would not fellowship with darkness. After speaking for a few moments, Tyler extended his hand to me. I replied that I would not be extending the right hand of fellowship to apostates. This set his wife off. She decided to come down and tell me that God is Love and I wasn’t very nice. I replied by pointing out what the Scripture says about apostasy, and how she needs to repent. Tyler interrupted at this point, and said, “I want to have a rational discussion.” My answer was, “I want to have a Biblical one.” With that they left. Please pray that the Lord converts them. After Noman finished preaching, I stood up to preach. I spoke about how Jesus needs to be lifted high as he alone is Saviour. I only spoke for about twenty-minutes, and then handed over to Craig to preach. Craig is from Glasgow, so he sounds like the people we are trying to reach. His accent actually drew the attention of the people. They stopped to listen, and some even began to heckle. Craig did a good job in answering their objections and pointing people to Jesus. Overall it was a good day in Glasgow. Quite a few conversations were had, and many heard the Gospel. Please pray the Lord softens hearts.